Year of the Dog isn't quite the comedy it's been marketed as, but there's still a lot to chew on here, notably Molly Shannon's performance as a woman on the verge of a nervous breakdown. 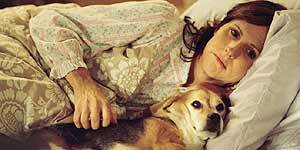 Molly Shannon plays Peggy, a spinster who lives alone with her beloved pet dog, Pencil, and works at a humdrum office as an assistant to a neurotic manager (Josh Pais). She lives vicariously through her friend and co-worker Layla (Regina King), who entertains her with various boyfriend-related stories, and through her brother and sister-in-law (Thomas McCarthy and Laura Dern), who are obsessed with raising their children correctly. However, when something terrible happens to Pencil, Peggy's life starts to unravel, forcing her to seek contact elsewhere, first with her neighbour (John C Reilly) and then with animal activist Newt (Peter Sarsgaard), who opens her eyes to a new passion. There's a well-known t-shirt slogan that goes, the more time I spend with people, the more I love my dog, and Year of the Dog is, essentially, a blackly comic dramatisation of that slogan. The posters and trailers may make it look like a light comedy but it actually works better as a character study of a woman who's about to have breakdown. Shannon is superb as Peggy and it's quite unsettling to see her usual loud comic persona so stifled. Although the character may be hard to warm to initially, you really feel for her when things start to go bad. The supporting cast are great too, especially Reilly and Sarsgaard, while Regina King and Diane Lane get all the best lines with their motor-mouthed characters. That said, as with writer-director Mike White's previous film, The Good Girl, there are very few actual laughs here. Providing you don't go in expecting a laugh riot, this is an enjoyable, blackly comic drama with a strong performance from Molly Shannon.